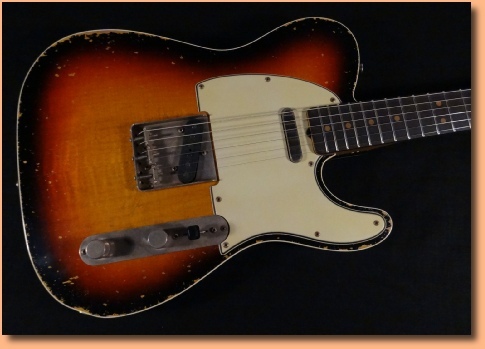 Classic T type look, double bound three tone sunburst. This is based on an early ‘64 model, still featuring the ‘transparent’ sunburst as opposed to the later ‘target burst’, it also features the vintage correct curved join fingerboard, clay dots with narrow 12th fret dot spacing. Gorgeous dark Amazon rosewood fingerboard, 6105 size frets and 9.5” radius make this a dream to play. 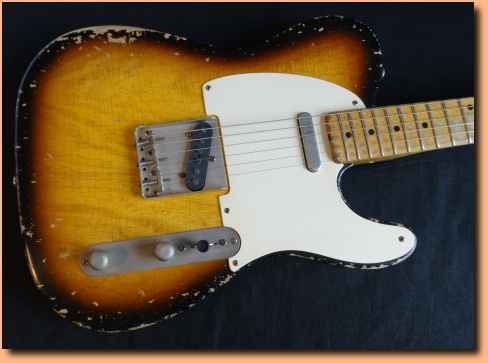 1955 style T type guitar, finished in a distressed two tone sunburst. One piece maple neck completes the ‘50’s look but had a 9.5” radius and 6105 size frets. 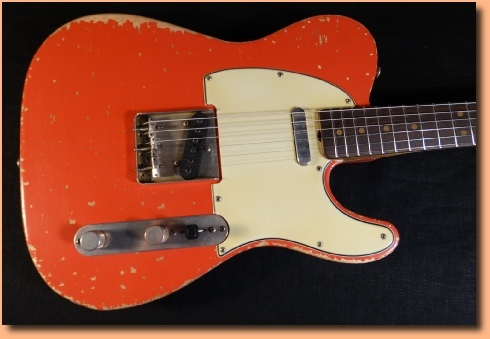 Single ply parchment guard, Bakelite switch tip, mid ‘50’s style saddles and dome knobs. Bare Knuckle ‘staggered ‘55’ pickups, CTS pots, CRL 3 way switch, Switchcraft jack. 1964 style T type finished in a cool heavily distressed fiesta red. Alder body, maple neck with a curved join rosewood fingerboard and clay dots. The neck features a 9.5” radius with medium jumbo stainless steel frets. Bare Knuckle ‘staggered 55’s’ pick up the vibrations, and those are wired through CTS pots and a CRL 3 way switch. 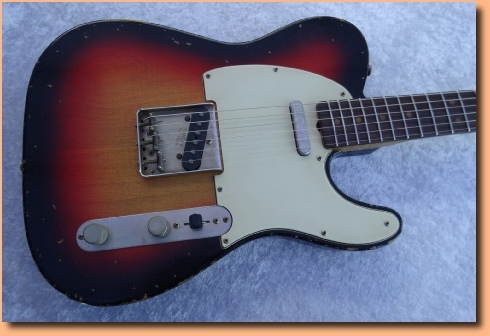 1963 style T type guitar, finished in a lightly distressed three tone sunburst. Alder body, maple neck with curved join rosewood fingerboard. 9.5” radius board with 6105 size frets gives a more modern feel than vintage but retains the classic look. Vintage style bridge with threaded steel saddles, three ply aged green guard and vintage style hardware throughout. Bare Knuckle ‘Staggered ‘68’ pickups fitted, they really suit the rosewood board perfectly.